From Maralinga, Pangea, to NFCRC – there always seems to be a UK connection. Anonymous pro nuclear “engineers” lobbied Canberra ministers and premiers. Steve Dale, 8 Sept 18 In the lead up to the leadership spill, there has been a concerted push for nuclear power. A letter written and financed (supposedly) by 5 veteran engineers was sent to all Canberra ministers and premiers. “The paper, prepared and circulated to MPs as a public service by what is claimed to be “a small group of professional engineers and scientists experienced in various aspects of electricity and distribution” …. The claims and costings can not be challenged if only the Australian newspaper and the cabinet ministers have seen this “paper”. Who knows, the claims and costings of the paper may have excited the pro-nuclear MP’s to the point of losing self-control, running amok, bullying their peers (especially the female ones) and triggering a mutiny. 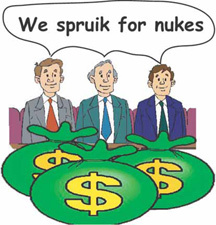 There seems to be an obscene amount of money being used to promote nuclear. I would still like to see a scan of the exact letter sent to MP’s, but not sure how to achieve that. Josh Frydenberg says government will focus on power prices over emissions reduction, Canberra Times By Stephanie Peatling, 9 September 2018 Treasurer Josh Frydenberg has conceded the Australian Parliament has failed to deal with the challenge of climate change as he confirmed the new Morrison government will concentrate on lowering power prices ahead of reducing greenhouse gas emissions. “What you will hear from us, which you will not hear from the Labor Party, is that we will put reducing people’s power bills first, over emissions. You will not hear the Labor Party say that,” he said……..
Mr Frydenberg’s comments on Sunday followed those made by Prime Minister Scott Morrison on Saturday when he said he would formally ask the Liberal party room to ditch the policy when it meets this week. Mr Morrison repeated his commitment to Australia meeting its international greenhouse gas reduction targets under the Paris agreement but said the target would no longer be legislated. New Energy Minister Angus Taylor is working on a revamped energy policy to take to cabinet. …….Mr Frydenberg said the issue of climate change was one which had bedevilled Australian politics for more than a decade……. Mr Frydenberg said he was confident Australia would still meet is international greenhouse gas reduction targets but people wanted to see the government acting on power prices. “The people of Australia want to see their power bills come down, and they want to see the government take whatever measure possible to do that,” Mr Frydenberg said. Labor’s energy spokesman Mark Butler said the government’s decision to walk away from the policy was a capitulation to the more conservative elements inside the Coalition. “…..Nobody alive or dead has ever seen anything like what just happened in the past few months. No human has ever lived with carbon dioxide levels this high in the atmosphere. And that carbon load continues to climb as motorized life and fossil-powered electricity spread across the globe. 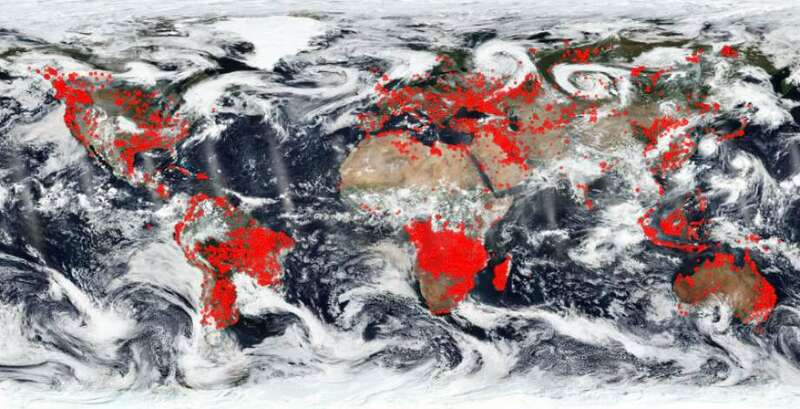 The human cloud of greenhouse gases found an echo as forests released their carbon on every continent. Here in British Columbia, on the west coast of Canada, we had our second year of fire emergency. Over 700 large fires burned through the mountains. Gigantic out-of-control blazes lit up the night, and then buried the whole sky with thick smoke, turning the day into night. Thousands were evacuated, turning on their vehicle headlights at ten in the morning…….. Thick smoke was blown down into Vancouver and Seattle and Portland. Then it blew back right across the continent, thousands of miles across the Prairies and into Ontario and New York State. Of course the smoke was rained out in the East, where a series of strange storms stoked up alternating high heat with hard-to-bear humidity and then unseasonable cold. Nobody in North America got a free pass to enjoy the summer. And that’s the thing. During my life, summer was the time of good weather you could count on, except for the occasional thunder storm. Now in the age of climate change, summer is the season to survive. When I was growing up, old people feared the winter. More old men and old women died during the cold weather. Now in the new climate times, the lore has changed. Old people should fear the summer. That’s true with the heat deaths this summer in Canada in 2018, and the mass heat deaths in Europe 2003. From Australia to California to Pakistan, we will dread the coming of summer. Think about that. Will France import 4 tons of nuclear waste from Australia? Liberation 8th Sept 2018, Will France import and process 4 tons of radioactive waste from Australia? It is spent uranium and plutonium that has been used in a research reactor. They will be treated at the Hague and returned to Australia. THE MELTDOWN AT the Chernobyl Nuclear Power Plant in northern Ukraine on April 26, 1986 was a massive tragedy that ultimately claimed at least 9,000 lives and affected millions more. It also created a toxic mess. Radioactive particles choked the atmosphere and rained down on cities, forests, and roads. In the immediate aftermath, fires had to be put out, debris cleared, contaminated waste buried deep underground.It was, obviously, not an easy task. Remote-controlled bulldozers and other robots proved too weak for the job, their circuitry fried by radiation. So the Soviet Union sent in humans—600,000 of them. These brave firefighters, soldiers, janitors, and miners—the so-called “liquidators”—did everything from hosing down streets to felling trees to building a concrete sarcophagus around the exposed reactor … all the while charged subatomic particles ravaged their cells and shortened their life spans. “No personal sacrifice was too much for these men and women,” says photographer Tom Skipp. Moved by their story, he visited Slavutych, Ukraine in April to photograph survivors, now in their golden years. The portraits make up his haunting series The Liquidators. “The liquidators were sent into impossible scenarios where even machines failed,” Skipp says. “Each has a human story seemingly entangled in the complex history of communism and duty to the motherland…. Tens of thousands of people took part in marches and other events across the US on Saturday, calling for a swift transition to renewable energy in order to stave off the various perils of climate change. Morrison will face mounting pressure from the vocal band of conservatives in his party room not to commit to anything on climate change, be it symbolic or tangible. What the government chooses to do next could have reputational repercussions for years to come. Climate policy is clearly a threat to our domestic politics and to the job security of Australian prime ministers. With further missteps it could upend our diplomacy as well. Lack of climate policy threatens to trip up Australian diplomacy this summit season https://theconversation.com/lack-of-climate-policy-threatens-to-trip-up-australian-diplomacy-this-summit-season-102845 Christian Downie Australian Research Council DECRA Fellow, Australian National UniversitySeptember 10, 2018 Australia has navigated a somewhat stormy passage through the Pacific Islands Forum in Nauru. Scott Morrison’s new-look government faced renewed accusations at the summit about the strength of Australia’s resolve on climate policy. Australia is neither a small nation nor one of the most powerful, but for many years it has been a trusted nation. Historically, Australia has been seen as a good international citizen, a country that stands by its international commitments and works with others to improve the international system, not undermine it. But in recent years climate change has threatened this reputation. This is especially so among our allies and neighbours in the Pacific region, who attended this week’s Nauru summit. With Australia’s new foreign minister, Marise Payne, attending instead of the prime minister – not a good look, albeit understandable in the circumstances – the government came under yet more international pressure to state plainly its commitment to the Paris climate agreement. Pacific nations may be divided on many issues, but climate change is rarely one of them. Before the meeting, Pacific leaders urged Australia to sign a pledge of support for the agreement and to declare climate change “the single greatest threat to the livelihoods, security and wellbeing” of the region. Australia ultimately signed the pledge, but also reportedly resisted a push for the summit’s communique to include stronger calls for the world to pursue the Paris Agreement’s more ambitious goal of limiting global warming to 1.5℃. Wagga Wagga by-election: Antony Green calls it for Dr Joe McGirr ABC News , By Nick Sas and Jennine Khalik 9 Sept 18, ABC election analyst Antony Green has called the Wagga Wagga by-election for independent candidate Dr Joe McGirr. Speaking on ABC News on Sunday night, Green said he felt safe calling Saturday’s by-election, slightly more than 24 hours after the polls closed. “He is a certain winner,” Green said. The race for the seat, which had been vacated by disgraced Liberal MP Daryl Maguire, became a two-man battle between Labor’s Dan Hayes and Dr McGirr after the Liberals were hit with a 29 per cent swing against them…..
WikiLeaks Whistleblower Awaits Fate, American Free Press , September 7, 2018 The fate of gutsy WikiLeaks founder and whistleblower Julian Assange rests in the hands of the government of Ecuador, first reported here in AFP’s Issue 33&34. Assange has lived at the Ecuadorian embassy in London since 2012 and will be instantly arrested by the UK if he leaves the building. Just-released news that his health is deteriorating rapidly makes even more urgent Ecuadorian action’s even more urgent. “Panglossian puffery”, says David Lowry. The report ignores the security and nuclear waste problems of small modular reactors. The Nuclear Free Local Authorities (NFLA) says this is yet another attempt to promote the benefits of SMRs despite large and quite possibly insurmountable hurdles to cross. The Government suggests the report was produced by an ‘independent’ group, yet at least half of the group have strong links to the nuclear industry, including the Nuclear Industry Association. The UK appear to be one of the few governments pursuing a strategy of promoting SMRs. Even France and Finland, the only other countries in Europe currently developing large nuclear projects, have no plans to develop such technology. Indeed France has just commissioned a whole raft of new smaller-scale solar energy projects. the finance sector is accurate in being sceptical of new nuclear developments given the rapidly decreasing costs of renewable energy. Rolls-Royce warned last month that it was preparing to shut down the [Small Modular Nuclear Reactor] project if the government did not make a long-term commitment to its technology. Small modular reactors (SMRs) generally have a capacity less than 600MW, with the costs ranging from £100 million to £2.3 billion, which the experts suggest could be delivered by 2030. The EFWG has recommended the government to help de-risk the small nuclear market to enable the private sector to develop and finance projects – it believes SMRs could be commercially viable propositions both in the UK and for an export market. NuClear News Sept 18 Tom Greatrex of the Nuclear Industry Association (1) says we should ignore the National Infrastructure Commission’s (NIC’s) recommendation that we only order one more nuclear station on top of Hinkley Point C before 2025 (2), because cutting carbon without the help of nuclear is a “risky business”. He says the Government understands the inherent value of a baseload low carbon source of generation. Australia is having similar debates where the fossil fuel lobby argues that because “coal” is “baseload”, it must therefore be “reliable”, but wind and solar are intermittent, so they cannot be relied upon to keep the lights on. It’s political rhetoric that belies the reality of the electricity system. Australia’s grid has challenges, but they are not necessarily ones that can be solved just by having more “baseload”. What is really needed – as the Australian Energy Market Operator, chief scientist Alan Finkel, and any number of other independent experts point out – is dispatchable and reliable generation, one that the grid operator can count on, at times of peak demand and heat stress. And the answer does not lie in traditional “baseload” generation – the more than 100 trips of big fossil fuel plants since December, often at times of soaring heat, underline that point. A NAIF loan of $150m will help add more than 50MW of solar PV and one battery storage system to airports in the Northern Territory. The post NT airports to get three new solar farms and battery storage, courtesy of Canavan’s NAIF appeared first on RenewEconomy.